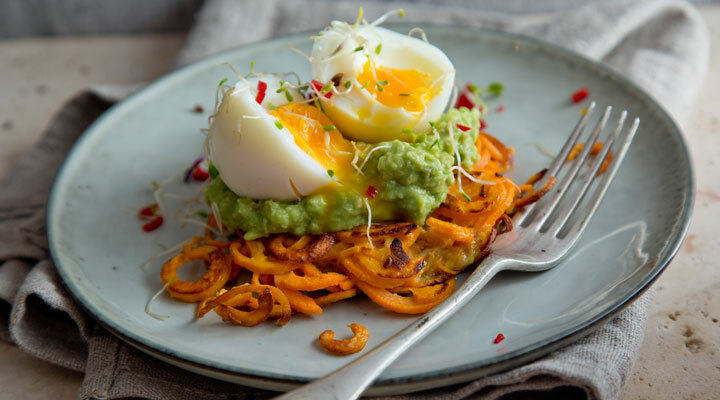 Spiralised sweet potato rosti are a great addition to any brunch and can be topped with just about anything, but personally I like them with a nice soft-boiled egg and avocado. Bring a small saucepan of water to the boil. Reduce the heat, add two of the eggs and simmer for 5 to 6 minutes. Remove from the heat and run under cold water to prevent them from cooking further. Peel off the shell and set aside. Spiralise the sweet potatoes on the narrow noodle blade. Add to a medium-sized bowl with the remaining two eggs, the garlic and some salt and pepper and mix together. Heat the oil in a large pan set over a low to medium heat. Use a tongs to divide the mix into four portions. Place on the pan and press down each portion into a circle, then cook for 4 to 5 minutes on each side. While the rosti are cooking, peel the avocado and discard the stone. Place the flesh in a small bowl and mash with a fork. Add the lime juice and season to taste. Serve two sweet potato rosti on each plate. Place a dollop of the mashed avocado on top, then add a soft-boiled egg, using a fork to break in half. Scatter over the sprouts and chilli flakes and serve straight away.